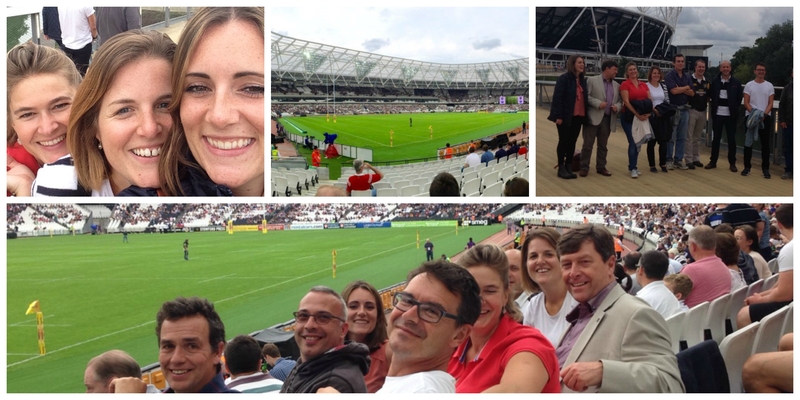 Instead of the traditional wine and dine schmooze, we thought we’d do something entirely different by taking our cherry-picked guests to a rugby game at the Olympic Park Stadium, in London. We met our five guests at a fantastic restaurant which was situated so perfectly that we could enjoy a drink in the sunshine whilst overlooking the Stadium and the Lea River…bliss! After we’d enjoyed a delicious brunch (thanks to Formans Restaurant) we took the five minute walk over to the stadium and found our seats with plenty of time to spare for selfies, sweets and a few pints of ale. Between the nine of us, we had a range of novices to avid rugby fans, all of whom enjoyed the exciting Barbarians vs Samoa game – especially when Samoa did their traditional Haka! Despite the water sprinklers un-promptly drenching the players halfway through the game, it was a special event and the first ever rugby game played at the Olympic Stadium. We were delighted that our guests joined us to experience the Olympic Stadium in all its glory. Let’s face it, it was just an excuse to have a bit of FUN!